Monsieur Chrono & a late night date. 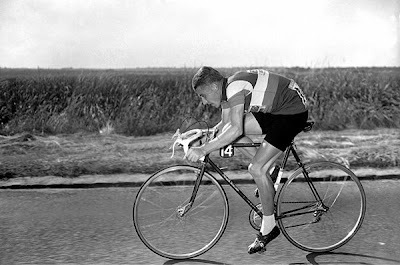 Jacques Anquetil's break into the big league of cycling happened in 1952. He turned professional, conquered and won the 142 km very long prestigious Grand Prix des Nations time trial race, at only 19. He would go on to win a total of nine, then the unofficial World Championships for time trialing. A young star was born. He got into cycling to improve his standing and to earn money. His forte was the time trial and it showed with an excellent 2nd in the 1953 Baracchi Trophy. Not bad finishing after the winner, Fausto Coppi. By the age of 20, he was already an Olympic bronze medalist and national champion. He broke the World Hour Record, breaking Coppi's 1956 title, which many thought could never be broken. Critics reviled him for his cool, calculated style of winning. He was pragmatic but was aloof. And he affirmed that a professional rider had a right to look after himself as he thought best, such as doping. His popularity was dented and won few friends. 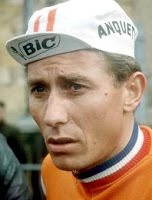 But in 1965, after having won the Dauphiné Libéré eight stage race, he took an airplane to Bordeaux, slept for an hour, and at 1:30 AM started the massive 557 km Bordeaux-Paris endurance race. He fought exhaustion and 15 hours later ... won! "I did everything I could to make him continue. In the end, I kept him going by massaging his ego. He abused and insulted me, but in the end, gritted his teeth and won," said Raphaël Geminiani, his manager. A late night date. 1965, shortly after winning the Dauphine Libere stage race. 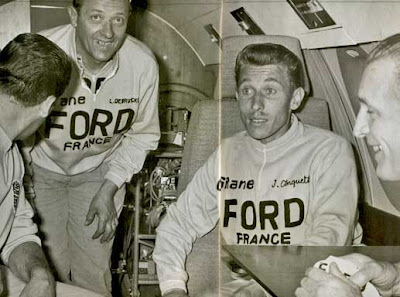 The exhausted but determined Master Jacques & upbeat crew on the airplane to Bordeaux-Paris - which he won as well. (Top): Time trialing was his speciality. Innovation was his, alone. He sometimes raced without handlebar tape to save weight. His wool race jersey's and short's were tailored made tight for 'aerodynamics.' His pedaling style was toe down. And, he used special silk tires said to reduce rolling resistance. "He was total harmony, sublime, a phenomenon. He blended with his bicycle like a musician with his instrument."